Watch the story of how a family are honouring their baby granddaughter Lily's memory through Candlelight Funds. Setting up a Candlelight Fund for a loved one is simple and we are here to provide you with support every step of the way. Just as we light a candle for a loved one who’s passed away, creating a Candlelight Fund in their name is a special way to remember them. Candlelight funds celebrate a life and touch thousands more. A Candlelight Fund is a special fund set up in memory of a loved one who has died, combining any donations made in their memory. A fund can be a personal act of remembrance or you can invite others to join in with the fundraising. There are no targets, deadlines or minimum amounts involved: this is your fund and you can grow it in whatever way feels comfortable. Lots of our funds are now online so friends and family can donate easily and whenever suits them. If there is a particular area of our work that meant a lot to your loved one, we will do our best to accommodate that. Just let us know. It is reassuring for us to hear how much Kieran’s fund is helping those in need. It gives us strength and a sense of purpose. If you would like to set up a lasting tribute to a loved one, or for more information on how to fundraise in their memory, please email Roisin at candlelight@cafod.org.uk or call her on 020 7095 5348 for a chat. 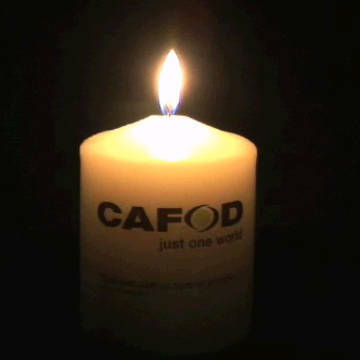 Thank you very much for thinking of CAFOD as a way to remember someone special. Celebrate your loved one’s life and memory by helping poor and vulnerable families around the world.